Austria-based Polytechnik has been hired by Hillerod Forsyning, the district heating company of the city of Hillerod in Denmark, to supply and install a turnkey biomass cogeneration plant. 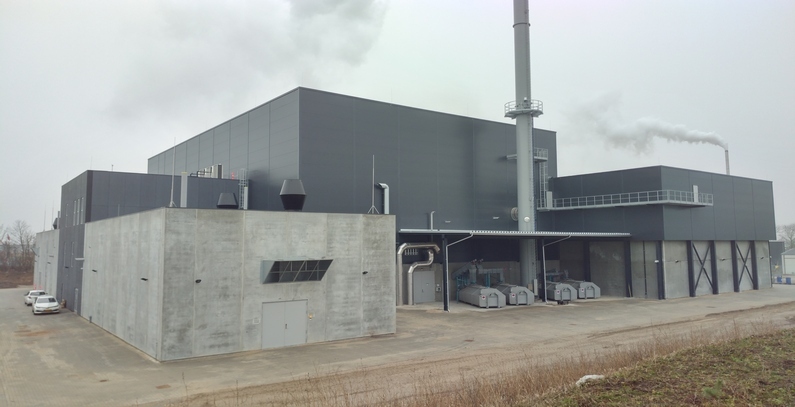 The Danish utility company manages a major district heating system that includes the new 28 MW wood chip-fired cogeneration plant designed for a maximum generator terminal power of 5.2 MWel. It is the largest such biomass cogeneration plant with Organic Rankine Cycle (ORC) technology built by Polytechnik in Europe. Contracting for the project was preceded by a complex multi-step tendering procedure in which Polytechnik has ultimately been able to prevail against all competitors. 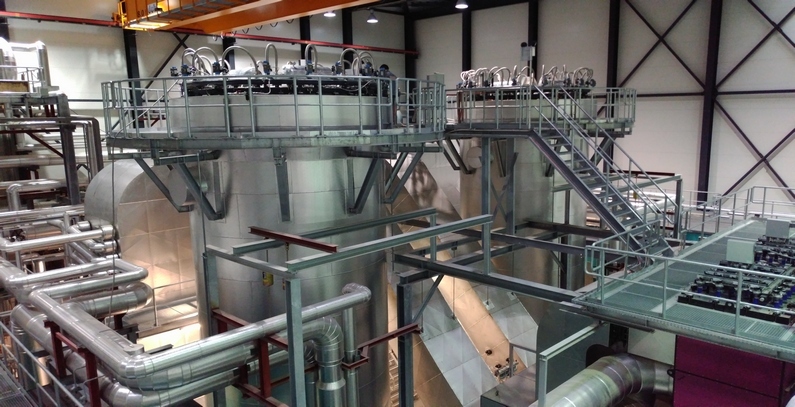 Polytechnik’s exceptional combustion technology, the high availability and longevity of the plants, the company’s comprehensive experience in building turnkey biomass cogeneration plants and the sophisticated technical concept for the application case have finally been the decisive criteria for the customer’s decision. The plot on which the new boiler house was to be built has only been accessible with restrictions in all directions. In the south, there is a directly adjacent recreational area with weekend and holiday homes. On the east side, there is a heavily frequented recycling park and at the western boundary, there was a landmarked stone bank whose removal was not permitted. In the north, there is the existing boiler house with a biomass plant that was needed for district heat supply and that consequently had to remain in operation. In spite of all those restrictions and the limited space, it has not only been possible to implement all requirements and specifications of the customer but planning and construction of the plant has in addition catered to good accessibility and maintainability of all plant components. The boiler house was planned and built pursuant to the latest European regulations and the Danish Building Code. Apart from the required social spaces, this includes accessibility for people with disabilities and resting areas for the employees. Besides, the operator has paid particular attention to an appealing design that alludes to biomass as a renewable source of energy. Due to the adjacent recreational area, special emphasis had to be placed on acoustic emissions. The technical building equipment complies with the highest standards and comprises, among other aspects, air-conditioned workspaces, an elevator system, barrier-free sanitary facilities, a central extraction system as well as a fire extinguishing system with low-expansion foam extinguishing stations that are particularly suited for thermal oil units. The boiler system consists of 2 firing and boiler lines working in parallel. This ensures a nearly perfect availability and high reliability. As Polytechnik plants can in addition be run in a broad power spectrum, the distribution over 2 lines leads to a very large control range. Depending on the fuel composition, the plant can be operated in the load range from 15% to 100%. Even in summer, the Polytechnik plant can still be run with a load of approx. 50%. Peak loads are easily buffered and balanced by a buffer storage unit with a storage capacity of approx. 600 MWh. Hillerod Forsyning’s biomass cogeneration plant burns exclusively wood chips made from untreated residual forest wood. During installation and building planning, attention was paid to maximum efficiency in fuel logistics. The wood chips are supplied by truck. They are weighed at first, and during each delivery, a fuel sample is taken and analyzed in addition. After concluded assessment and acceptance of the delivery, the fuel is tipped directly into a low-positioned fuel bunker. From this tip-down bunker, the fuel is distributed in the fuel storage by means of two redundantly designed indoor cranes. A smart logic ensures optimal mixing of fuels with different textures in this process so that the firing system can always be fed with a nearly identical fuel quality. The fuel storage is generously sized and the acceptance area was lowered by 5m. The entire bunker therefore has a fuel capacity for 7 days of full-load operation. 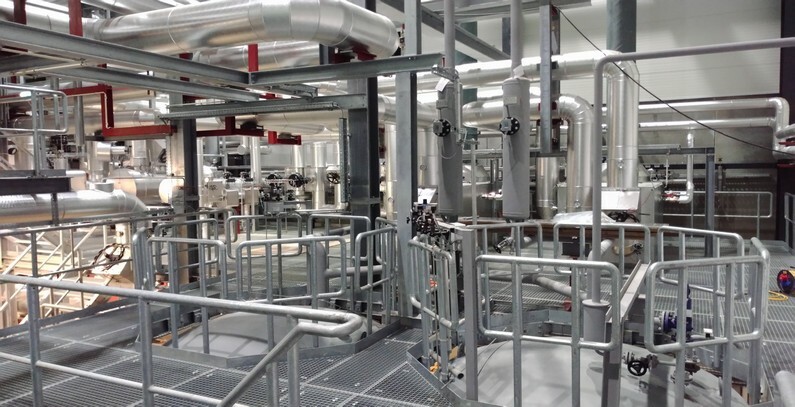 The proven, robustly designed and hydraulically actuated walking floors and cross conveyors supplied by Polytechnik have been used for fuel conveying. They are characterized by high flexibility with regard to the fuel composition and high reliability and availability. The fuel conveying system is equipped with sliders moving in opposite directions and with fire extinguishing systems so that any backfire from the furnace to the fuel storage is prevented reliably in all operating modes and in particular also in case of malfunction. The Polytechnik firing units, which are each equipped with an adiabatic combustion chamber and a hydraulically actuated push grate, form the centerpiece of the plant. The generous dimensioning of the combustion chambers ensures complete combustion of the wood chips with minimum emissions, even in cases in which the fuel has a moisture content of over 50%. Combustion takes place in several steps; feeding of combustion air and of recycled flue gases into the combustion chamber occurs via several fans that are controlled individually by means of frequency converters. This enables accurate control and monitoring of the combustion chamber temperature, on one hand to ensure complete burn-out and on the other hand to prevent the formation of carbon monoxide or thermal nitric oxides to a large extent. After fully completed combustion of the wood chips, the hot flue gases flow through the two thermal oil boilers. Here, a large part of the thermal energy is transferred to the thermal oil circuit. In this process, the thermal oil is heated to approx. 312°C. Each of the boilers has a nominal output of 12.5MW. As the thermal oil as the medium is sensitive to overheating, the flue gases flow around the pipes in thermal oil heaters. The thermal oil itself flows in the pipes. Therefore, the thermal oil volume flow can be monitored easily. Depositions of fly ash can form on the pipes. They can impair the thermal transfer and therefore worsen the efficiency of the plant. 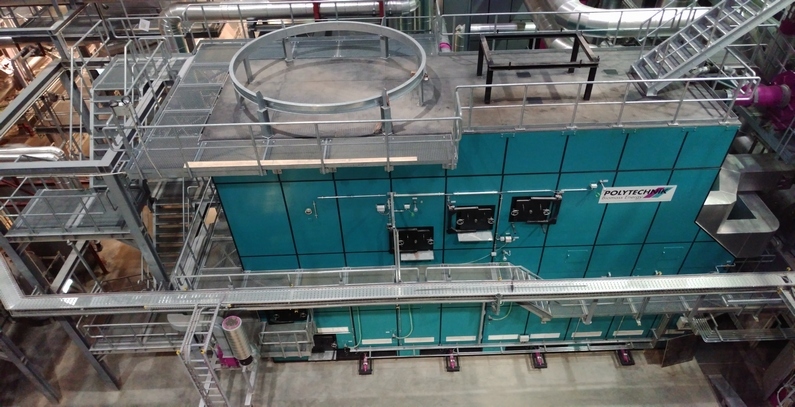 To prevent this, Polytechnik has installed the new Poly-clean heating surface cleaning system by means of which the ash depositions can be eliminated in a fully automated way while the plant is running. In this process, a heat-resistant compressed air hose with a nozzle on its end is wound and unwound on a hose reel and inserted in the boiler in an automated way through connection pieces intended for this purpose on the heater lid. Through the rotary movement of the base frame and the axial lateral movement of the hose reel, any positions along the defined circular area (pipe cage lanes) can be approached. The enables cleaning of the whole boiler heating surface whereby long travel times can be achieved while maintaining a nearly constant high efficiency. Cleaning is very gentle and without causing any abrasion on the heating surfaces. For thermal oil systems, Polytechnik uses nearly exclusively fittings with weld ends. In addition, comprehensive calculations are made to ensure that the maximum admissible forces and momentum onto the unavoidable flange connections of pumps and apparatuses will not be exceeded even at a maximum operating temperature and hence maximum heat expansion (pipe statics). To increase plant efficiency, respectively one thermal oil economizer and subsequently an air pre-heater were installed after each thermal oil boiler. Therefore, a combustion efficiency of the boiler systems of more than 89% can be achieved, even at an operating temperature of 312°C and if thermal oil is used as a heat transfer medium. Pre-separation of fly ash from the flue gases occurs by means of multi-cyclones. Both the air pre-heaters as well as the multi-cyclones are designed and manufactured by Polytechnik itself. Separation of particulate matter from the flue gases subsequently takes place in an electric filter. Already for years, efforts have been made in Denmark to reduce the operating temperatures of district heating grids because this is fundamentally beneficial for plant efficiency – regardless of the heat generation type. Apart from higher efficiency in the transfer of heat, the heat losses in the district heating grid are also reduced. At the time of contract, the district heating grid in Hillerod was operated with a return flow temperature of approx. 45°C. 35°C should be achieved in the medium term. In connection with the wet fuel, these are optimal conditions for a flue gas condensation system. In case of a fuel moisture of 45% and a return flow temperature of 45°C, the flue gas condensation system generates 4775kW of heat when operated at nominal load, without additional fuel being required for this purpose. Through the use of a condensation system, the intrinsic dust content of the flue gas is already reduced to an extent that the statutory limits can be complied with. Nevertheless, Polytechnik has installed an electric filter upstream of the condensation system. The formation of sludge in the system is reduced significantly as a consequence and the condensation system has a much longer availability. The official measurements have shown emission levels to be much lower than the statutory and/or contractual limits. At the customer’s request, Polytechnik installed an additional heat pump by means of which the flue gases can be cooled down even further after condensation. The heat pump has a COP value of >5. Hence, an additional heat of up to 2400kW can be generated for an electric drive power of approx. 400kW. ORC modules have numerous advantages compared to conventional steam turbines. For example, no superheater is required by the plants. Compared to steam power plants, they are run at a significantly lower operating pressure, the medium is not corrosive and does not have to be treated, and water will not be consumed continuously. The commonly raised objection against the ORC technology according to which steam turbines have a higher efficiency than ORC turbines is only true for the pure condensation operation. In the cogeneration operation, an ORC module can achieve efficiency levels that are similar to the ones achieved with a backpressure or extraction condensation steam turbine. Besides, ORC modules can be operated in a large power range and/or at a very low partial load and started in a fully automated way. As the cogeneration plant in Hillerod should be run exclusively in a heat-controlled way, the advantages of the ORC technology have eventually prevailed. Each of the two ORC modules in Hilleroed has a generator terminal power of 2,600kW. The stringent Danish Grid Code had to be respected during connection of the modules to the public grid in Denmark. It is essentially equivalent to the BDEW Guideline (BDEW Richtlinie) applicable in Germany. ORC are equipped with directly coupled asynchronous generators by default. Asynchronous generators require a stable grid as a reference variable. However, this does not ensure compliance with the requirements of the Danish Grid Code. For this reason, the modules for the biomass cogeneration plant in Hillerød had to be equipped with synchronous generators. Polytechnik plants are controlled via a Siemens SPS. All operating data are visualized and saved chronologically. In Hillerod, all signals are in addition transferred to the control center of a nearby gas power plant. Hillerod Forsyning’s biomass plant thus operates for the most part independently and without constant supervision. The safety emergency cooling concept by Polytechnik, which was developed specifically for thermal oil units, has already proven successful and been tested and approved by TÜV. All Polytechnik plants can be monitored via remote control. The customer’s staff and the Polytechnik team can access the visualization at any time and from any location via the internet and monitor the operating parameters. After two years of construction, the biomass cogeneration plant started delivering heat to the district heating system in August 2016, while generators started feeding electricity into Denmark’s public grid on September 8, 2016. The facility has since been running without interruptions. With regard to operation at nominal load and a fuel moisture of 45%, approx. 27.5MW of useful heat and approx. 3.5MW of power (net) are generated by the entire plant for a fuel heat output of 28.6MW. The plant efficiency therefore amounts to approx. 108.5%. Apart from the entire plant technology, Polytechnic also delivers all the necessary documentation for obtaining permits, as well as all construction works and other services.